2018 Land Pride SA20 for sale in Norfolk, NE. Dinkel Implement Co.
Land Pride's SA20 is a lighter planetary drive Post Hole Digger ideal for land owners, landscapers, hobby farmers, or contractors. 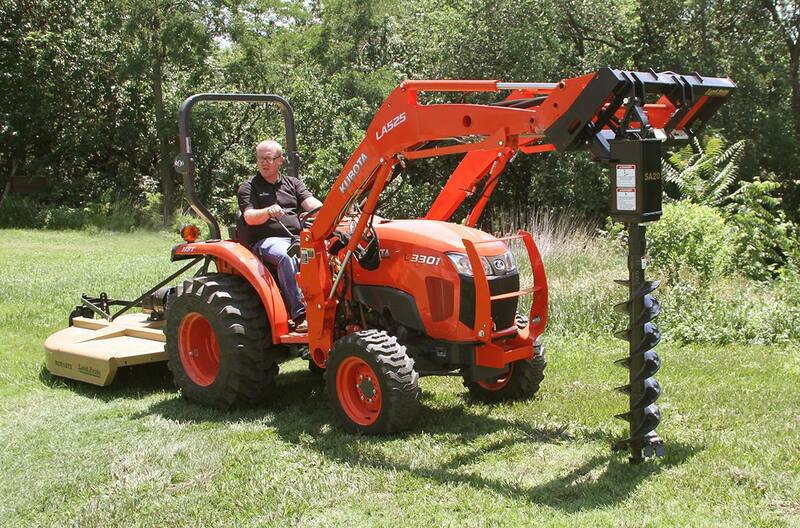 The Land Pride SA20 digs holes from 9" to 36" in diameter and up to 48" deep or deeper with available auger extensions. With 10 different augers available - 7 double flight augers from 9" to 36" and 3 tree augers in 24", 30", and 36" sizes - the SA20 is a versatile and dependable tool. Skid/loader plate hitch: Fits a wide range of tractors and skid steers. Easy hook-up and unhook capabilities. Loader arms can be used to apply additional down force. Center and 18" offset mounts on auger hitch: Choice of two mounting points allows operator to pick which mount is best for accessing hard-to-reach places and for best line-of-sight. Steps are incorporated into mounting points for safe entry to skid steers. Gusseted corners & hitch bar: Provides added strength where others do not. Dual openings for hose routing: Allows hoses to be routed out either side of hitch frame. Patent pending vertical indicator: Indicates when auger is vertical, makes it easier to drill straight vertical holes. 2" Hex output shaft: High torque resistance. Choice of drive motors: Three flow ranges (6-15 gpm, 10-20 gpm, and 15-30 gpm) cover a wide range of skid steers and tractors. Hydraulic hoses routed out top of motor/gearbox housing: Allows motor/gearbox housing to follow auger into hole and dig a deeper hole without damaging hoses. Some competitors don’t offer this. Large selection of augers: Variety of sizes and styles to suit many applications. Base Weight without Options: 46 lbs. Auger length: 9" Auger size = 49" All other auger sizes = 50 3/4"
Gearbox oil capacity: 14 oz. 9, 12, 15, 18, 24, 30, 36 in.